Specialty labels manufacturer Schreiner MediPharm has developed a novel marking solution for syringes. The solution, Pharma-Multi-Act, features a label-integrated perforated tab that ends on the syringe cap. The label, together with the cap, is can be opened with one flick of the wrist. Schreiner MediPharm said it will exhibit the range of possibilities offered by the label’s special design at interpack event in Düsseldorf, which is due to held from May 4 to 10, 2017. The marking label’s first opening indication is automatically triggered along the perforation when the cap is being opened. A single flick of the wrist will allow to open the label and the container at the same time, eliminating another process to remove the seal. Generally, syringes need special protection from tampering and they should also be activated fast and effectively without impairing the injection process. The fewer moves needed for the activation the better, Schreiner noted. In most cases, it is also important to document the administered medicine in the patient’s file or vaccination card. Another major reason cited by the company for designing the syringe has been the need for documentation of administered medicine in patient’s file or vaccination card. According to Schreiner, while opening the Pharma-Multi-Act, a readily accessible and detachable documentation label is exposed on the cap. This cap can be easily peeled off, even with gloves. Besides this, the area underneath the label can also be used as an indicator field for several functions which can range from covert warning message, additional security feature for authentication, integrated NFC chip for interactive applications and temperature or UV indicator which activates when the label is opened. 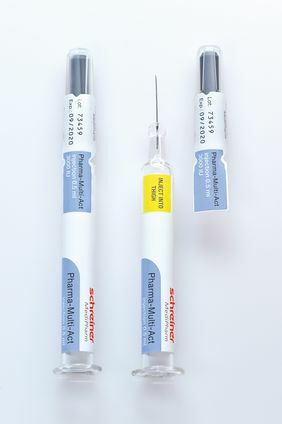 Image: Schreiner MediPharm develops new marking solutions for syringes. Photo: Courtesy of Schreiner Group.